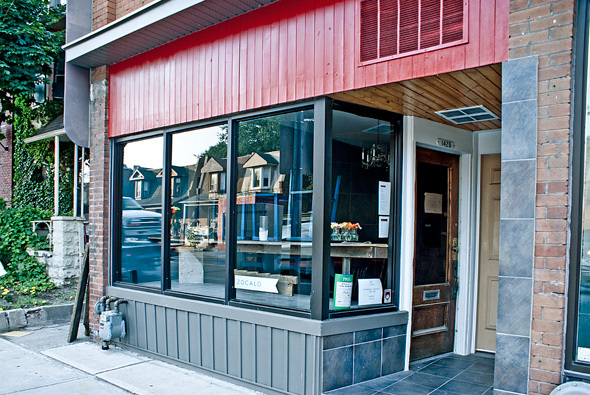 Zocalo, another recent addition to the roster of casual restaurants in Bloordale Village , is one of those places that just feels like a neighbourhood spot. 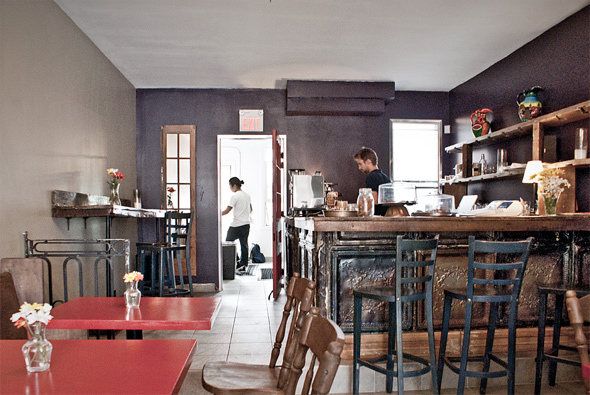 Narrowing the gap between Bloordale and the Junction , Zocalo's unassuming storefront resides at Bloor and Sterling, a little further west of this strip's developing concentration of restaurants and cafés. The small space is bright and welcoming, and the friendly owner immediately makes us feel like we've been hanging out here for ages. Zocalo is currently open only during the daytime (dinner service will begin once a pending liquor license is complete). We arrive on a Saturday afternoon to sample the lunch menu. The charming decor is simple and rustic, all wood and neutral colours punctuated by a handful of bright red tables dotted with little vases of fresh flowers. 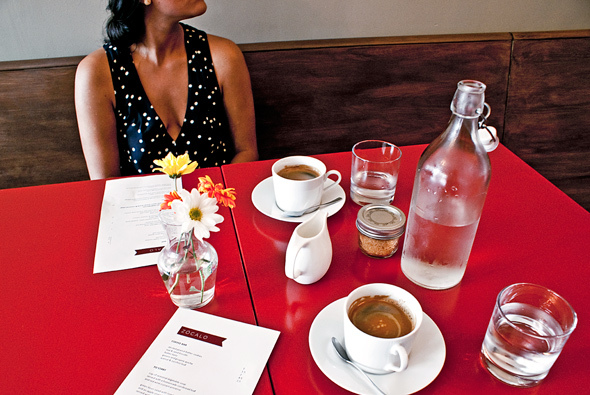 At the back of the restaurant is an eye-catching bar, atop of which rests an espresso machine that produces the tasty americanos ($2.25) we start with. The menu is a small but diverse collection of interesting items. The brief card is divided into baked goods, starters, and sandwiches... sort of. Broken bread sandwiches, to be more specific, which the owner explains is sort of a deconstructed sandwich. The warm, fresh bread comes on the side of a plate of sandwich ingredients, all separate so they can either be eaten as an assemble-yourself type of sandwich, or separately, perhaps as a salad of sorts. A little strange, but something different anyhow, and since the various ingredients are separately quite tasty we can't complain. Our first broken bread is the pommery fennel and egg mash ($10 - top photo). The mash is like egg salad, served cold and mixed with fennel, fresh herbs and mustard. The combination of crunchy fennel and fresh dill with the egg is good itself, but made even better by the delicious accompanying tomato relish which is very tangy. 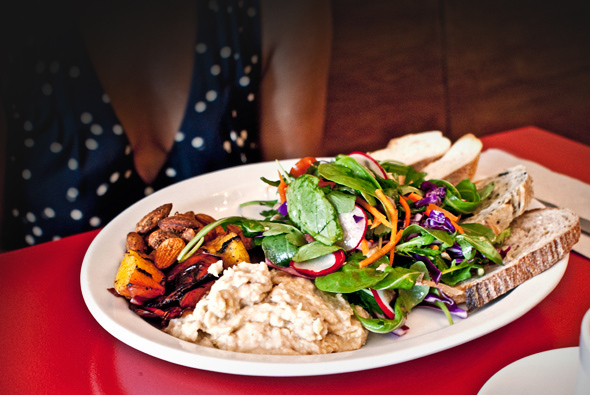 This dish also includes a chunk of soft cheese, green salad and both white and whole grain bread. The slices of baguette aren't exactly conducive to creating one sandwich-like item, so I mostly try and get a little bit of each ingredient on my fork and proceed from there. Logistics aside, this proves to be a winner. We also try the grilled peaches and peppers ($10), another broken bread, which is accompanied by sweet corn hummus and spiced, roasted almonds. The sweet and smoky peaches and peppers pair well with the spiciness of the almonds and the garlicky hummus, another appealing mixture of flavours. 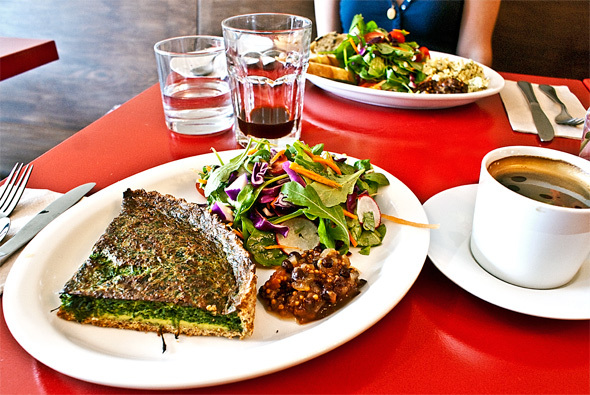 The greens and gruyere quiche ($7.50) is a generous slice of savoury homemade spinach, cheese and egg pastry, sided with salad and paired with the same tomato relish which adds a perfect punch here as well. I'm enjoying my egg mash, but I experience dish envy when this plate arrives in front of my friend. More than one bite is definitely in order. 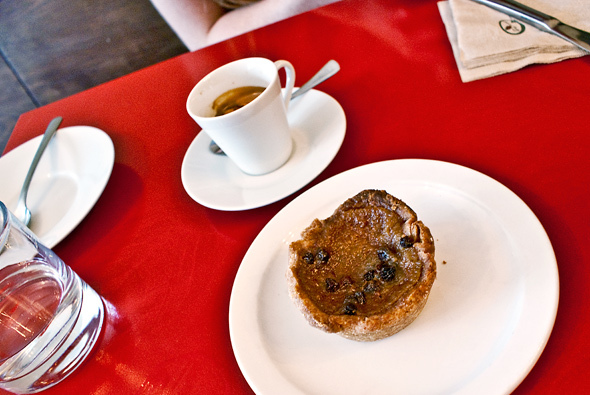 Feeling fully caffeinated after another round of coffee, we decide to finish the meal with one of the homemade butter tarts ($2) that tempt me from a cake stand on the bar. My dining companion, a resident of the neighbourhood, chats away with the owner who informs us that he and his partner are also long-time Bloordale-ians and proud contributors to the transformation underway in this area. With the warm, welcoming atmosphere and the satisfying fare, we leave feeling that our visit to Zocalo was a Saturday afternoon well spent.